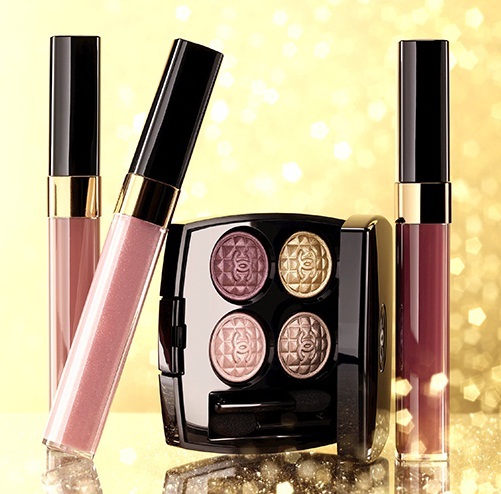 Chanel's Holiday 2012 Collection, Éclats du Soir de Chanel, has started to arrive in stores. I purchased my treasures at Neiman Marcus Mazza Gallerie. One of them is Rigard Signé de Chanel Quadra Eye Shadow in Harmonie du Soir. It reminded me so much of Topkapi that I had to pull out last year's quad to compare them. They are different. Intrigued by the alchemy of precious metals, Peter Philips, Creative Director of Chanel Makeup, debuts a resplendent Holiday 2012 Collection, Éclats du Soir de Chanel. Gold and bronze shade harmonies dust the eyes with festive shimmer, while soft beige, pinks, and deep reds set face, lips, and nails aglow. The Harmonie du Soir Quadra Eye Shadow palette ($65) offers shades of bronze gold, taupe, violet plum, and pink. I think it's covet-worthy - even though one shade is basically unwearable on my ultra-fair skin. I have almost no time to gush. This feature must publish in about five minutes. The sun popped out, and so did I, dashing outside to get photos. I swatched heavily with a sponge-tipped applicator and took my photos in full, afternoon sun. I swatched in clockwise order, starting with the gold at the top left in the palette. Sorry about the Band-Aid; it's part of my life (somewhere on my body) these days. The gold shines exactly as you would expect a holiday gold to glow. The brown is stunning - absolutely, seriously stunning. The pink is a nice one that we will all be able to wear. The red? It's a tough color. You be the judge. Can you wear this shade on your eyes? I may play with it to see how it looks as a blush. Naturally, I purchased the shimmering soft pink Joues Contraste blush in Star Dust. I'll show it to you tomorrow.Stay tuned. I have so much beautiful new holiday makeup, but very little sunshine. In my area, Neiman Marcus Mazza Gallerie is the only Neiman Marcus store that has received Chanel's Holiday 2012 Collection. I was at Saks today, and Georgia and Loyd were bummed that they don't have it yet. Give them a few days and they will. Beautiful Palette of colors...i think I just may have to seek this one out. It's really too bad that Europe gets Chanel a month after we do! Claudia, either this one or the new Guerlain Liu would suit you nicely for the holidays. Remember Les Ochres from years & years ago? Sort of a variation of that. Another Chanel quad I don't need (but do?!) Almost too beautiful to wear, maybe to collect. Yep, sure do! Wear it! Hmmmm...how does that red shade compare to the red shade in the Chante Elephants palette? Christine (Temptalia) has an eye look featuring Harmonie du Soir which she did about a week ago. Although her look is quite editorial, you get a very good idea of the colors. The plum is definitely plum and not at all like the earthy copper of the Elephant palette. Also, the finish of the two shadows is quite different. Wow, that palette is more gorgeous swatched than how it looks in the pan! Love it! I've been waiting for this since missing out on Topkapi! But I think the reddish shade is a deal-breaker, I can't see myself wearing it. Gail, the Chantecaille shade is brown. This one is mauve, plummy red. Totally different. Eileen, we must be on the same wavelength. I just turned to comments after writing up Star Dust. Goodness, my friend, we have both moved on to Spring/Summer with Peter Philips! Christy, then I'm jealous of you too! Those shades make me look like an albino bunny. Not only have I seen them, I have them! If the darn sun would come out, I could get photos of my backlogged makeup treasures. Tomorrow! The weather guys promised me sun tomorrow. Today? It's raining. Yep, applying the shades to skin bring them to life. Oh Lovethescents, I wish you were closer. We could get you application lessons! Done, Rosemary, and just published. Isla, do what I plan to do. Wear it applied lightly as a blush. It works! Love it! Wish I could have it! Chanel quads were $56 now they switch the digits to $65. I hope this is only because its a holiday palette! Another lovely set of shadows from Chanel! :-) Though I agree with you, I'm not really enthused about the reddish color, but the other three are lovely. You had me wondering if I had flipped the numbers. Had to check another blog! Pfew! I got it right.